As some of you may remember, MJ and I have this twin sock thing. We get the same yarn, we knit the same socks (seriously, down to the number of repeats or rows of cuff ribbing!) and then we wear them 2002 miles away from each other. I Google mapped it. One time our twin socks even got to meet! Pattern: Twists and Turns by me! This is only the second time I’ve knit this pattern – the first one was, of course, for the sample in the book. I still like it. I finished them at knitting group last night, which I think may be the first time I’ve ever finished a project there. I was forced to pull out my backup project – it was great! So now that these poor neglected socks are done, it’s time for the next pair of twin socks. These ones were unintentional, since I got the yarn from a club and MJ got it as a gift, but it is indeed the same yarn, so why not twin socks? I think most knitters have had a yarn that just wouldn’t work. You couldn’t find a project, or when you did it never worked out, or maybe you just hated it… Well, I love this yarn. The color is lovely but the past two projects just haven’t been right. 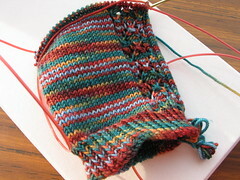 First I tried to make Reversai for Sock Madness in April 2008 – the yarn and the pattern were just a bad match, so I frogged them. Then they developed a new destiny… the Anastasia socks, which I still want to make… someday. They were just too big and I’m really not a fan of knitting socks toe-up. But there’s no motivation like MJ, so now they’re going to begin a new life as twin socks, with a twisted 1×1 rib cuff and otherwise just stockinette. Hopefully this one will stick. When Snarfy and I bought the same brand of yarn at the Superbowl sale, we decided to make fraternal twin socks. 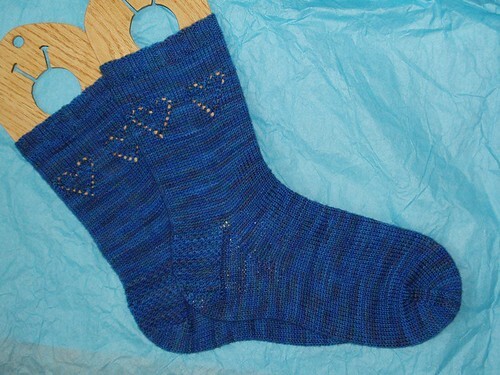 One night at knitting group – just before I moved up to Seattle – I wound off some of my blue for her and some of her green for me, and the Snarfytwin socks were born. These socks were a long time in the making, mostly because they kept getting pushed to the bottom of the bag as I knit other more time-sensitive projects. But they were the perfect socks for a few rows of bus knitting in the morning, and when I got to the toe yesterday I figured they should be finished. 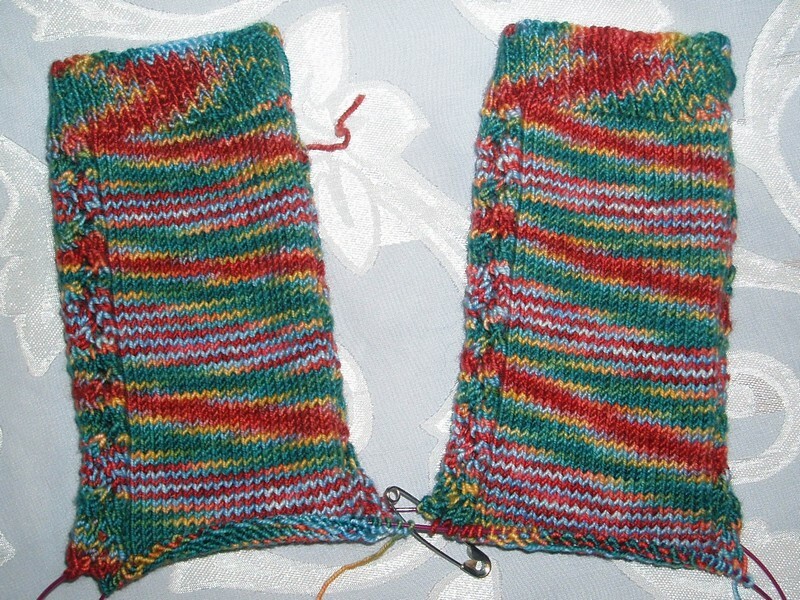 Of course, knitting socks with contrasting bits gives you lots of ends… I have to remember that next time I think about doing contrasting ribbing, heels, and toes in my socks. Secret knitting still continues, so the blog might be quiet for a bit longer. Of course, deadlines for being able to show you some of these projects are coming up so the blog will soon be full of things I finished already. Sock Camp Part II… and more! The third day of sock camp, I had a class in with Stephanie Pearl-McPhee (that would be the Yarn Harlot) on lever knitting. It is much more charming when said with a Canadian accent. 😉 I was very excited to learn this because, as a more-or-less “continental” knitter, purling is a pain. I am actually quite happy with my speed when knitting stockinette in the round, or even garter stitch, though I rarely knit flat. But ribbing is practically the bane of my existence. 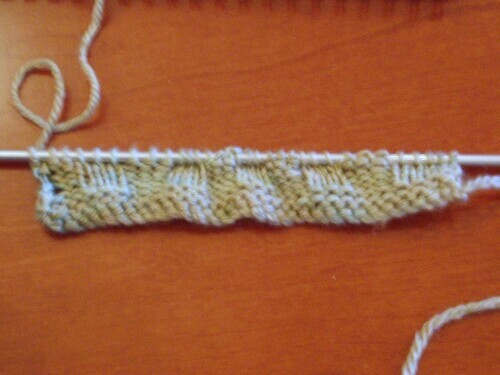 Well here is my very first lever knitting swatch, I started out with garter stitch and moved to a 3×3 rib. We were told that we were basically going back to our knitting infancy, and would probably (temporarily) have the same problems as we did when we were new knitters. Though I picked up the technique pretty quickly, I was indeed a very very tight knitter all over again. But I picked up a set of long straights to practice with. 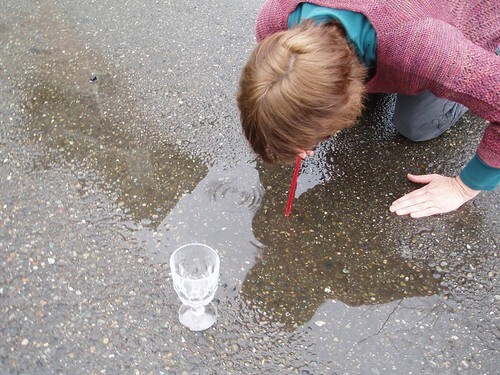 A very brave team member mouth-siphoned it out of a puddle with a straw. And look at her gorgeous sweater! Of course, later on it started pouring. 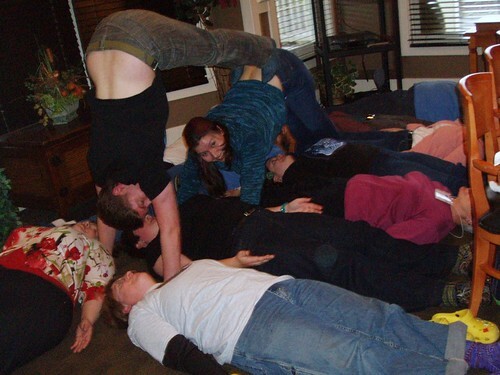 This is what sock camp is like. We are all nuts. It’s great fun, but you have to be prepared. Friday morning we had our last class, with Cat Bordhi. She taught us a new and top secret sock architecture which I can’t share, but here’s a picture of my skeined up dyed yarn from the first day. I used it to start the sock in her class. My goal this year was not to get attached to my homework, since in past years we’ve given them away, but this year we got to keep our own. Although mine was small and didn’t take too long to knit, it turned out really cute but it was a pain to make the ruffle! I was going to write up the pattern, but I don’t know if anyone else would really want to go through the hassle. I started the heel flap on my Snarfy-twin socks on the ferry home. And when I got home I found Wendy’s new sock book, Socks from the Toe Up, which I won in her blog contest. I looked through it and it’s awesome! Plus, it came signed. I’ll definitely be sockin’ on. It’s MJ’s birthday today, and she has a fabulous new free pattern out which I was luckily enough to test knit this spring – Polly Jean. I highly recommend it. 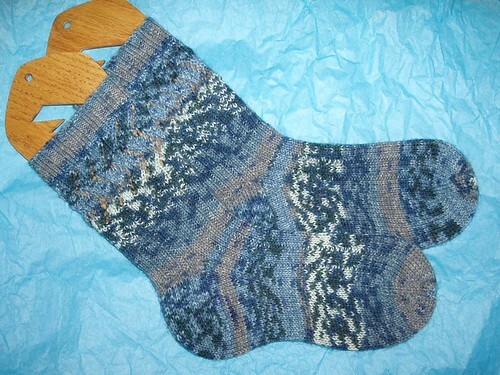 There are a couple more pictures on my ravelry project page and quite a few more on MJ’s blog linked above. Now everyone go tell her how awesome she is. Today I’m headed off on a yarn crawl with some of the local knitters – to a bunch of shops I’ve never been to. Should be exciting! Most knitters know about gauge. It’s that evil monster that has something to do with numbers and makes your projects not come out the right size! In all seriousness, I don’t mind a little math and I’ve been lucky so far to not have encountered a gauge-related knitting disaster. And, really, I still haven’t. But in the last couple days I had a very interesting and visually apparent issue with gauge… so I’ve decided to share it. Because I’m all for admitting my mistakes obsessive tendencies. The pattern calls for a size 2.5mm needle and 8 stitches / inch gauge. I wrote the pattern and that is what I did the first time, but with a slightly thinner yarn. I checked with MJ, her gauge was exactly 8 stitches / inch. I checked my gauge again, and it was off by less than 1/4 stitch per inch. 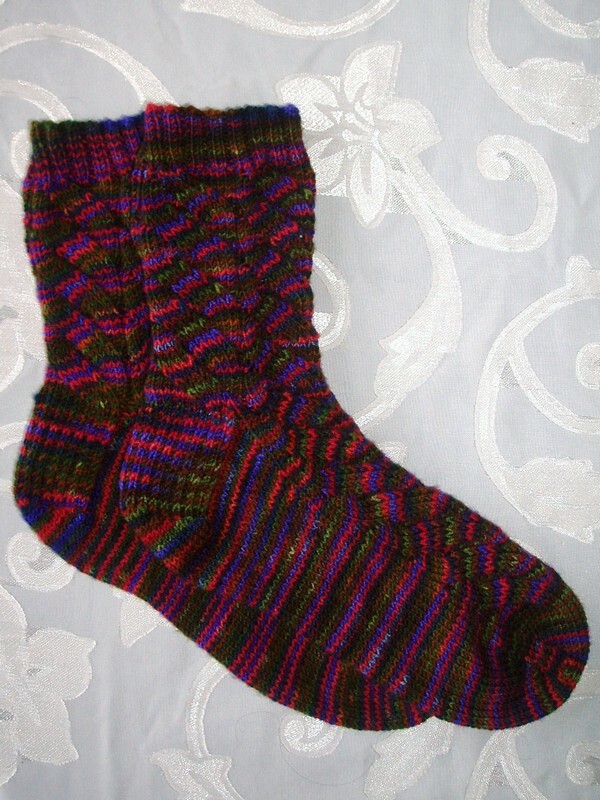 The socks would have fit just fine, but I didn’t like the way the colors were coming out. I debated ripping them out and starting over with a true size 1 (2.25mm) needle, but I wasn’t sure it would make that much of a difference. We debated. We looked on Ravelry and saw that – as one expects with a hand-dyed yarn – there were finished projects with more yellow than our skeins had. 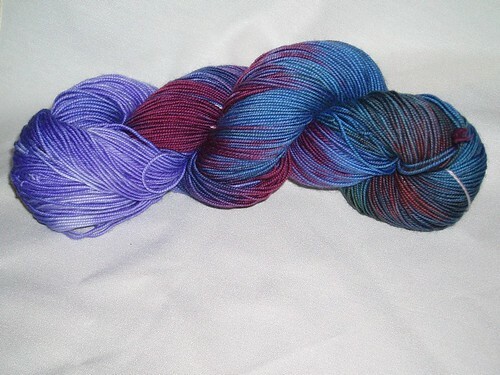 In fact, our skeins weren’t bought at the same time, so who knows if they’re even in the same “lot” so to speak… Maybe they would never look the same! Uh… wow! Even I didn’t expect it would make that much of a difference – I mean really, it’s a .25mm difference in needle size, less than 1/4 stich per inch difference in gauge… Wow. Yep, it’s a loom. No, I didn’t buy it, I’m borrowing it from Stephania. And I didn’t warp it either, it came that way. 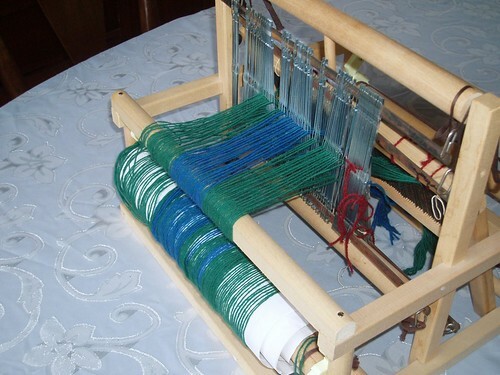 I’m excited to figure out a bit about the loom – I figured I’d use the exisiting warp for a bit of a practice to figure out how to get it working and then warp it. So… anyone have any suggestions about places online for info for a very beginner weaver? Is there a knitty of weaving? 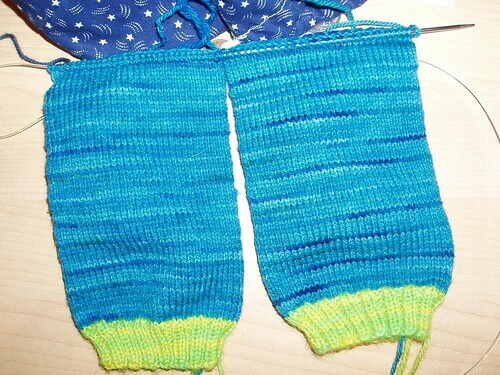 As I mentioned in the last post, MJ and I are making Diamondy “twin socks” in Space Dust. It’s not really my colors, but since it was my camp name I had to get some. MJ is knitting way faster than I am, and I feel like the mother of a small child telling myself in my head “This is not a race!” Do you hear that MJ? Twin socks are not a race! Of course, I’m consoling myself with the fact that, since I’m knitting two at once, I already have the whole horrible 1×1 twisted rib section done. 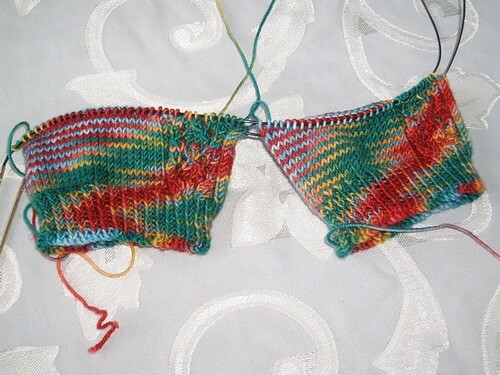 I HATE knitting 1×1 twisted rib, but it is so pretty when it’s done! I couldn’t believe I had put it in this pattern, but I did and so I knit it. I was complaining to MJ on IM too, but really I only have myself to blame. I also got my first 2009 Rockin’ Sock Club package today. I know there’s a big issue with spoilers, so here’s what I did… I posted the photo to my flickr, but if you go there you wouldn’t see that. 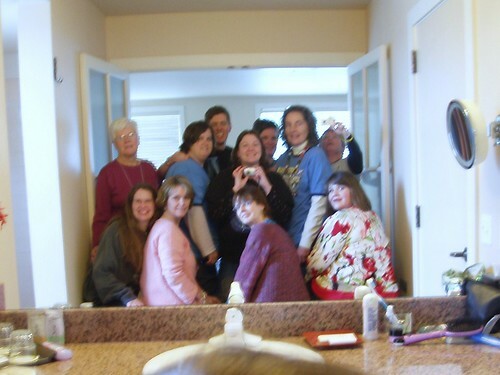 To see it you have to click the links below, which is a “guest pass” to the photo, which is marked as private. Hopefully this is a good solution to not spoiling (even accidentally) while still letting people see it if they want to. Let me know if it won’t work or something. I won’t say anything spoily either, but I will say that I really like this kit and intend to make it soon so more spoiler links may be in order. 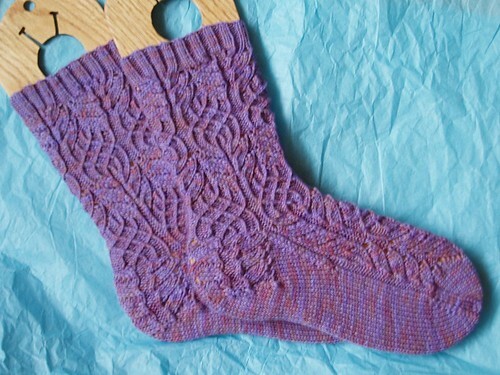 The Nutkin sock pattern was mentioned as being a quick one on the Yarn Harlot’s blog, so I decided to have a look. 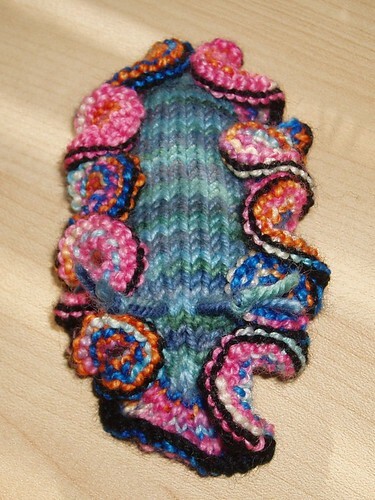 It’s a lovely pattern, and the color pictured reminded me of a skein of Tiny Toes I had hanging around, so voila! a gift was born. The yarn is very nice stuff – knotted in the center of the 100g skein so it winds into two balls, which I’m beginning to enjoy. It’s a soft any springy 2-ply with a fairly tight twist – kind of similar to Socks That Rock but less… shiny if that makes any sense. I think it’s the looser twist and fluffiness that does that. I really have no complaints about this yarn other than the fact that there were occasional fuzzballs (little bits of fluff that make a spot in the yarn thicker and more fuzzy) attached to the yarn, but they were pretty easy to remove so it wasn’t really an issue. 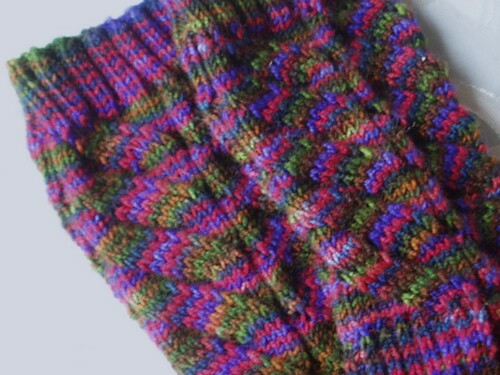 The socks bias slightly due to the decreases that form the pattern all going in the same direction – it’s not a problem and was mostly gone after blocking. Perhaps they’ll swirl a bit when worn, but that’s ok. But combine this fact with my love of mirrored symmetry? I’m going to have to make another pair of Nutkin-inspired socks for myself with a mirrored mod on the swirls and a couple other changes… I had a thought about the toe shaping as well but I haven’t crunched the numbers in my head yet. What’s next? Well, lots of things. 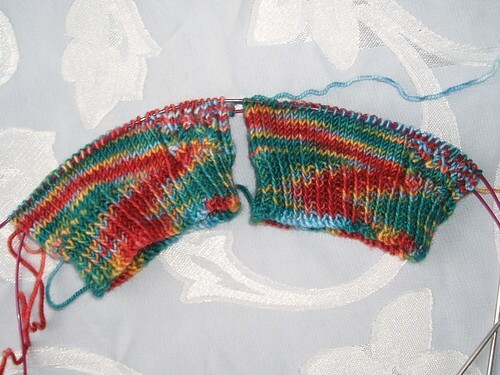 But MJ and I have started a new pair of twin socks – Diamondy in Socks That Rock colorway Space Dust. 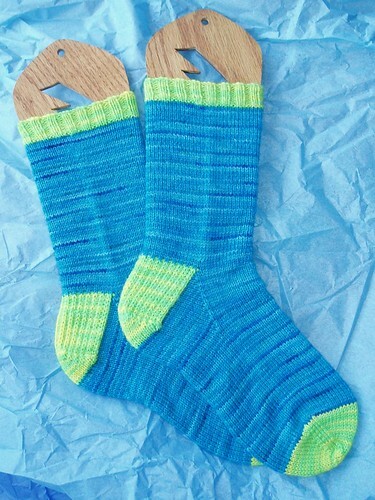 The first year at BMFA sock camp my nickname was Space Dust, so of course I had to buy a skien although it’s not my usual colors. Even though I designed Diamondy over a year ago, the original socks were a gift so I still don’t have my very own pair. 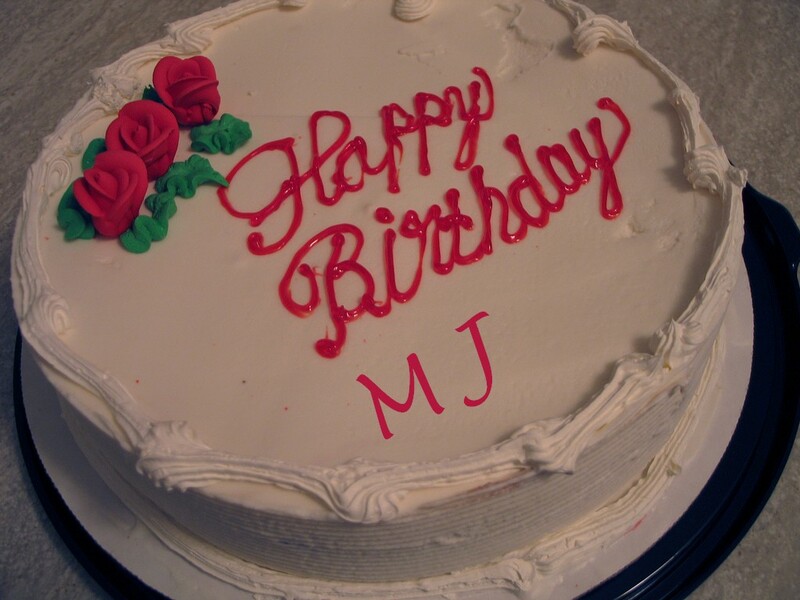 But if MJ’s progress is any indication, I will soon!